No food represents the waning days of summer better than blueberries. Although you can get them all summer long, their peak season is August—just when the daylight hours are starting to get shorter again and the evenings are punctuated by a new chill. Their flavor represents the time just before the bittersweet return of fall. At this time of year you can buy blueberries in bulk, and yes, you can freeze them whole or preserve them in jars. But the more important challenge is this: how can you best savor them? How can you make the most of this fleeting season of bounty and enjoy the last days of summer in their fullest and juiciest form? These gorgeous muffins showcase the blueberry flavour and colour that represents August so accurately. They’re ideally enjoyed as a lazy weekend patio breakfast with a second—no, a third—cup of coffee. They’ll evoke that moment of summer no matter when you eat them. And the bonus prize? They’re nutritious, too—blueberry consumption is associated with potential benefits for both cardiovascular health and cognition. 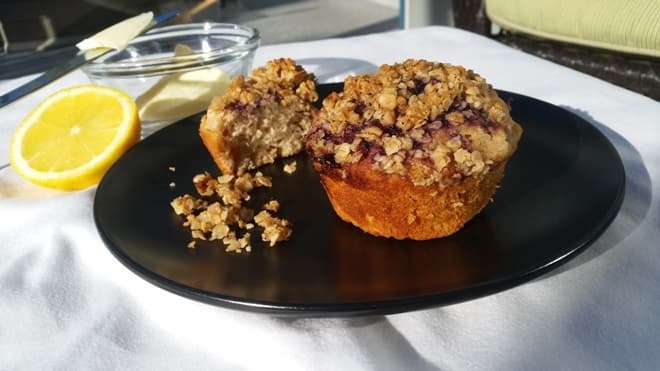 These muffins pack in a substantial amount of gut-friendly fiber with the addition of spelt flour and oats; plus, controlling the amount of sugar is possible by varying the amount of crumble topping. Embrace the summer blueberry moment—it’ll be gone before you know it. In a saucepan, combine the blueberries, water, and lemon zest and juice over medium heat. Bring to a boil and continue boiling for 5 minutes. Remove from heat and let the mixture cool slightly. Add vanilla. Blend until smooth. (An immersion blender works well, but be sure to cover the mixture!) Set aside. Mix the ingredients together with a fork and set aside. Mix flours, baking powder, sugar, and salt in a large bowl. In a medium-sized bowl, beat the egg slightly and add the milk and butter. Add wet to dry ingredients, stirring until just mixed. Fill greased muffin tins half full with batter. Using a spoon, make a well in the center of each one. Into each well pour 1 Tbsp. blueberry sauce, and then cover with 1 Tbsp. topping. Bake at 425 degrees Celsius for 18 minutes. Makes 12 muffins. Kristina Campbell is a freelance science writer specializing in the gut microbiota and digestive health.